قنبر نژاد مغانلو, حامد, ریاحی, محمد علی, باقری, مجید, سیدعلی, سید محسن. (1396). تعیین محدوده مخزن با استفاده از وارون‌سازی هم‌زمان داده‌های لرزه‌ای. مجله ژئوفیزیک ایران, 11(3), 45-56. حامد قنبر نژاد مغانلو; محمد علی ریاحی; مجید باقری; سید محسن سیدعلی. "تعیین محدوده مخزن با استفاده از وارون‌سازی هم‌زمان داده‌های لرزه‌ای". 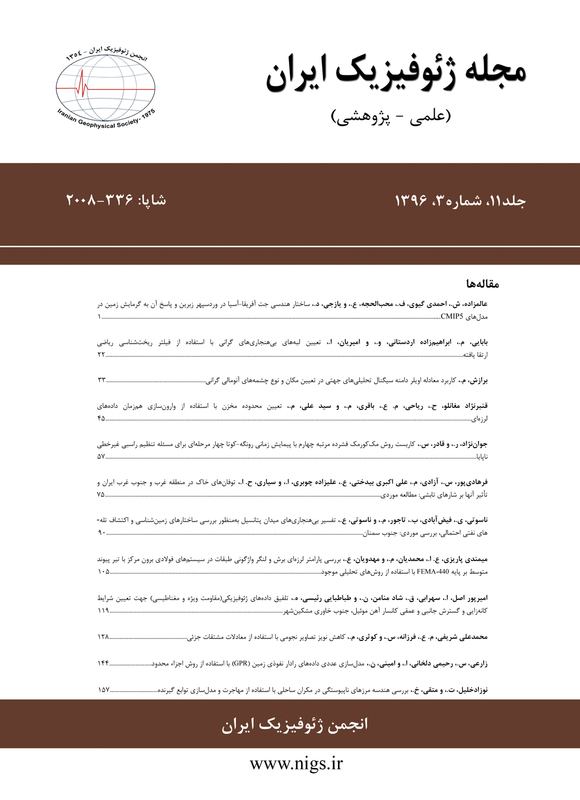 مجله ژئوفیزیک ایران, 11, 3, 1396, 45-56. قنبر نژاد مغانلو, حامد, ریاحی, محمد علی, باقری, مجید, سیدعلی, سید محسن. (1396). 'تعیین محدوده مخزن با استفاده از وارون‌سازی هم‌زمان داده‌های لرزه‌ای', مجله ژئوفیزیک ایران, 11(3), pp. 45-56. قنبر نژاد مغانلو, حامد, ریاحی, محمد علی, باقری, مجید, سیدعلی, سید محسن. تعیین محدوده مخزن با استفاده از وارون‌سازی هم‌زمان داده‌های لرزه‌ای. مجله ژئوفیزیک ایران, 1396; 11(3): 45-56. لرزه‌شناسی اکتشافی به‌طور گسترده‌ای مورد توجه مهندسین نفت بوده است، به‌طوری‌که بیشترین میزان هیدروکربن­های شناخته شده در سال‌های اخیر با استفاده از روش‌های لرزه‌ای بوده است. تعیین محدوده مخزن با استفاده از روش لرزه­شناسی بازتابی به‌طور جدی از سال 1930 شروع شده و تاکنون مورد توجه بوده است. قدرت تفکیک بالای داده­ها و هزینه پایین در مقایسه با حفاری، این روش غیرمستقیم را در اکتشاف هیدروکربن­ها بسیار ضروری نموده است. تاکنون روش­های مختلفی برای تعیین محدوده مخازن هیدروکربنی معرفی شده است که یکی از معروف­ترین آنها روش‌های وارون­سازی داده­های لرزه­ای است. در وارون­سازی پس از برانبارش، از داده‌های لرزه‌ای پس از برانبارش استفاده می‌شود. در این حالت تنها اطلاعاتی که می­تواند از روی داده‌ها تخمین زده شود، مقاومت صوتی موج تراکمی می­باشد. در وارون­سازی هم‌زمان پیش از برانبارش که از داده‌های لرزه‌ای پیش از برانبارش استفاده می‌کند، علاوه بر مقاومت صوتی موج تراکمی، اطلاعات موج برشی، چگالی و همچنین نسبت پواسون از روی داده‌ها قابل استخراج می‌باشد. بنابراین وارون­سازی هم‌زمان پیش از برانبارش اطلاعات بیشتری را نسبت به وارون­سازی پس از برانبارش نتیجه می‌دهد. در این مقاله از روش وارون­سازی هم‌زمان داده‌های لرزه‌ای پیش از برانبارش برای تعیین محدوده مخزنی در یکی از میادین هیدروکربنی خلیج‌فارس استفاده شده است. با استفاده از این روش، کمیت‌های مقاومت صوتی موج تراکمی، مقاومت صوتی موج برشی و چگالی تخمین زده شدند. در محدوده مخزنی کمیت‌های مورد نظر با کاهش غیرعادی مواجه شدند که دلیلی بر وجود ناهنجاری هیدروکربنی در این محدوده است و به‌این‌ترتیب محدوده مخزن مورد نظر شناسایی شد. Poststack seismic inversion generally transmutes seismic amplitude to P-wave acoustic impedance, which lacks low-frequency component due to the stacking process. This component should be compensated using well logs as a priori constraint. If this low-frequency trend is known with adequate accuracy, poststack inversion could produce precise results. Nevertheless, in most cases, the mentioned information are far from the true model. In such cases, poststack inversion results could have high uncertainty. Because there is no mode conversion at normal incidence, postsatck inversion is completely acoustic, hence P-wave impedance is the only information which can be extracted from poststack inversion of P-wave data. In simulations prestack inversion, in addition to the P-wave acoustic impedance, S-wave information, density, and Poisson’s ratio can also be derived from prestack data. Thus, prestack inversion can be used to get more information than poststack inversion. The two-step process of acoustic impedance and shear impedance by model-based inversion is replaced by one-step pre-stack simultaneous inversion. In order to apply simultaneous inversion method to our prestack seismic data, the data should be transformed from offset domain to angle domain as the first step. A useful approach is to calculate offset as a function of incidence angle, using Snell’s Law to follow the ray path through the layers if velocity information is available. The next step is to build initial models of acoustic impedance, shear impedance, and density. We built these initial models using sonic log, Delta-Time Shear (DTSM) log and RHOB log which were available in the interest area. There are two relationships that should hold for these wet rocks. The first relationship uses this fact that in wet clastics the ratio of the s-wave velocity over p-wave velocity should be constant within a rock layer. After reformulation of the mentioned trend, one can understand that the natural logarithm of shear impedance has a linear relationship with the natural logarithm of acoustic impedance. The second fact uses Gardner equation. After reformulation of the Gardner relation, it is understandable that the natural logarithm of density has a linear relationship with the natural logarithm of acoustic impedance, too. We determined k , kc , m and mc which respectively are slope of the natural logarithm of shear impedance against natural logarithm of acoustic impedance, intercept of the natural logarithm of shear impedance against natural logarithm of acoustic impedance, slope of the natural logarithm of density against natural logarithm of acoustic impedance, intercept of the natural logarithm of shear impedance against natural logarithm of acoustic impedance. Besides, we need a set of angle-dependent wavelets which are derived from angle stacks. Hence, we built three angle stacks; near-angle stack (0 to 11 degrees), middle-angle stack (11 to 20 degrees) and far-angle stack (20 to 29 degrees). Using these angle stacks, we built three statistical angle-dependent wavelets from three angle stacks. Finally, with log information, we built an initial model for acoustic impedance and tried to solve the inversion matrix using conjugate gradient method. Solving the equation, we can derive acoustic impedance, shear impedance, and density sections simultaneously from prestack data. Using simultaneous inversion, we identified hydrocarbon reservoir. Chopra, S., and Castagna, J. P., 2014, AVO: SEG Investigations in Geophysics No. 16. Fatti, J. L., Smith, G. C., Vail, P. J., Strauss, P. J., and Levitt, P. R., 1994, Detection of gas in sandstone reservoirs using AVO analysis: A 3-D seismic case history using the geostack technique: Geophysics, 59(9), 1362-1376. Gardner, G., Gardner, L., and Gregory, A., 1974, Formation velocity and density—the diagnostic basis for stratigraphic traps: Geophysics, 39, 770-780. Hampson, D., Russell, B., and Bankhead, B., 2005, Simultaneous inversion of pre-stack seismic data. SEG Annual Meeting Abstract. Ma, X., 2002, Simultaneous inversion of prestack seismic data for rock properties using simulated annealing Geophysics, 67(6), 1877-1885. Martins, J. L., 2006, Elastic impedance in weakly anisotropic media: Geophysics, 71(3), D73-D83. Mallick, S., 1999, Some practical aspects of prestack waveform inversion using a genetic algorithm: An example from the east Texas Woodbine gas sand: Geophysics, 64(2), 326-336. Misra, S., 2008, Global optimization with applications to geophysics: Ph. D. thesis, University of Alberta, Canada. Russel, B. H., 1988, Introduction to Seismic Inversion Methods. Simm, R., and Bacon, M., 2014, Seismic Amplitude an Interpreter’s Handbook, ISBN: 9781107011502.